Recent versions of flashrom support the -p ft2232_spi (or -p ft2232spi in older flashrom revisions) option which allows you to use an FTDI FT2232/FT4232H/FT232H based device as external SPI programmer. This is made possible by using libftdi. flashrom autodetects the presence of libftdi headers and enables FT2232/FT4232H/FT232H support if they are available. 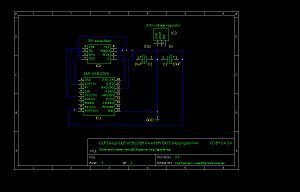 The DLP Design DLP-USB1232H (datasheet) can be used with flashrom for programming SPI chips. Sidenote: The module can also be used as JTAG programmer with OpenOCD support. 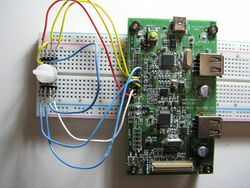 In order to use the DLP-USB1232H device as SPI programmer you have to setup a small circuit (e.g. on a breadboard). See the schematics for details (you can also download the schematics as PDF for easier printing). 1 DIP-8 SPI chip — — This is the chip you want to program/read/erase. 1 3.3V voltage regulator TO-220 3.3V E.g. LD33V or LD1117xx. You must connect/shorten pins 8 and 9, which configures the device to be powered by USB. Without this connection it will not be powered, and thus not be detected by your OS (e.g. it will not appear in the lsusb output). You need a 3.3V voltage regulator to convert the 5V from USB to 3.3V, so you can power the 3.3V SPI BIOS chip. You can probably use pretty much any 3.3V voltage regulator, e.g. LD33V or LD1117xx. For usage on a breadboard the TO-220 packaging is probably most useful. You have to connect two capacitors (e.g. 100nF and 10uF as per datasheets, but using two 10uF capacitors, or even two 47uF capacitors also works in practice) as shown in the schematics, otherwise the voltage regulator will not work correctly and reliably. The WP# and HOLD# pins should be tied to VCC! If you leave them unconnected you'll likely experience strange issues. 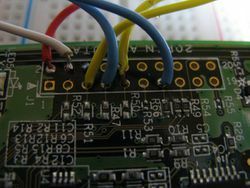 All GND pins should be connected together (pins 1 and 10 on the DLP-USB1232H, pin 8 on the SPI chip, pin 1 on the voltage regulator). The FTDI FT2232H Mini-Module Evaluation Kit (datasheet) can be used with flashrom for programming SPI chips. The FTDI FT4232H Mini-Module Evaluation Kit (datasheet) can be used with flashrom for programming SPI chips. 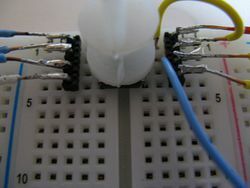 openbiosprog-spi is an Open Hardware USB-based programmer for SPI chips, designed by Uwe Hermann. It uses an FTDI FT2232H chip and features either a DIP-8 socket or a pinheader where jumper-wires can be attached. The user-space source code is part of flashrom, the schematics and PCB layouts are licensed under the CC-BY-SA 3.0 license and were created using the open-source Kicad EDA suite (GPL, version 2). For more information and downloads, including a parts list, Gerber file downloads, recommended Kicad settings, and recommended PCB manufacturer settings, see http://randomprojects.org/wiki/Openbiosprog-spi. RushSPI is an Open Hardware USB-based programmer for SPI chips, designed by Nikolaj Schlej. It uses an FTDI FT232H chip and features a DIP-8 socket and a pin header. The user-space source code is part of flashrom, the schematics and PCB layouts are licensed under the CC-BY-SA 3.0 license and were created using the open-source Kicad EDA suite (GPL, version 2). For more information and downloads, including schematics, parts list, Gerber files, etc. see http://randomprojects.org/wiki/RushSPI. The Amontec JTAGkey2 can be used with flashrom for programming SPI chips. JTAGkey and JTAGkey-Tiny should work, if you add them to ft2232_spi.c (untested). More info can be found on on the JTAGkey site. You need a 3.3V voltage source - see above for details. The WP# and HOLD# pins should be tied to VCC. The "Cable pinout" picture below shows the colors on the breakout cable. The Olimex ARM-USB-TINY (VID:PID 15BA:0004) and ARM-USB-OCD (15BA:0003) can be used with flashrom for programming SPI chips. The ARM-USB-TINY-H (15BA:002A) and ARM-USB-OCD-H (15BA:002B) should also work, though they are currently untested. The following setup can then be used to flash a BIOS chip through SPI. 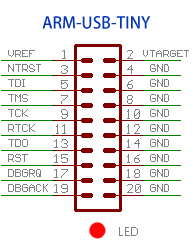 On the ARM-USB-TINY, VREF, and VTARGET are internally connected, and all the GND lines (even numbered pins, from 4 to 20) share the same line as well, so they can be used to split VCC/GND between the voltage source and the target. The voltage source should provide 3.0V to 3.3V DC but doesn't have to come from USB: it can be as simple as two AA or AAA batteries placed in serial (2 x 1.5V). Found Winbond flash chip "W25X80" (1024 kB, SPI) on ft2232_spi. This page was last modified on 23 January 2017, at 14:58.